Megan Slattery leads a Sunrise Yoga class, one of the group fitness classes offered by Recreation Services. 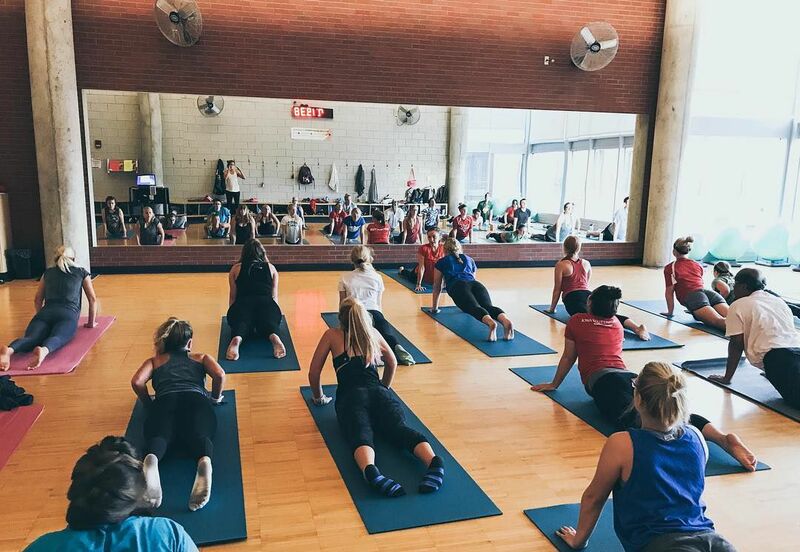 Students participated in yoga bright and early this morning as Fashion Week 2019 continued with the “Namaste in L.A.” event. From 8 to 11 a.m. sunrise yoga sessions were lead every hour by gym employees in court number two at State Gym. “We just really thought it matched the L.A. vibe that we were going for and we really just wanted to have something that people could come and calm down with and wake up with and just be able to relax during Fashion Week,” said Mara Claeys, co-director of the Fashion Week committee. Along with yoga, free smoothies from Tropical Smoothie Cafe were offered. The assortment of flavors to choose from included the “Kiwi Quencher,” “Blueberry Bliss,” “Sunshine” and “Peaches and Silk.” Participants also had a chance to enter a giveaway for a $50 PacSun gift card. The event was originally supposed to be held on the Campanile lawn but had to be moved indoors due to weather circumstances. Participants all appeared to be very at peace and relaxed during the yoga session. Attendees Katherine Siebert and Ally Aichinger said the event was a great opportunity to do something fun all while supporting The Fashion Show. The Fashion Show 2019 will be at 7 p.m. Saturday in Stephens Auditorium. Tickets are available for purchase through Ticketmaster or at the Stephens Auditorium Ticket Office.